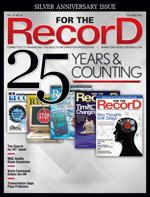 In honor of For The Record’s 25th anniversary, I was tasked to reflect on the changes EHRs have undergone during that time. As a pioneer who became hooked on EHRs when a few parallel efforts produced electronic systems during the 1970s and as a passionate advocate for EHR optimization, I find it interesting that these systems share approximately the same birthdate as For The Record. In other words, let’s begin with the 1990s. While most US industries had plunged into data and transaction automation by 1990, health care organizations were lagging in converting patient medical records from paper to electronic files. However, the 1991 publication of The Computer-Based Patient Record: An Essential Technology for Health Care changed the conversation inside hospital boardrooms. The landmark text presented a blueprint for introducing computerized patient records, including addressing privacy and confidentiality concerns, costs, training needs, and legal barriers. The Institute of Medicine’s Computer-based Patient Record (CPR) committee defined the CPR as an “electronic patient record (ie, a repository of health care information about a single patient) that resides in a system specifically designed to support users through availability of complete and accurate data, alerts, reminders, clinical decision support systems, links to medical knowledge, and other aids.” The committee further identified 12 specific attributes that comprehensive, robust CPRs must possess. For the first time on a grand scale, the CPR was not viewed as a computerized representation of the analog chart but as the clinician’s intelligent assistant, used routinely with each patient at the point of care. A few years later, the text’s revised edition included the creation of a CPR institute. The CPR buzz aligned well with the decade’s other technological advances, resulting in the IT industry delivering larger amounts of computing power in smaller boxes. This allowed EHR software to be accessible and affordable even to ambulatory practices. For example, technology breakthroughs in 1980s-built personal computers thrust 1990s health care automation to the bedside. Meanwhile, the rise of the Internet enabled secure communication and data sharing not just between providers but also among patients and other entities. The Internet also allowed more EHR systems to be delivered through remote “clouds” instead of being housed onsite while the browser became the de facto EHR user interface. Homegrown EHR systems, typically developed in large, academic medical centers, matured at the same time a plethora of vendors offered commercial, off-the-shelf products to take advantage of the still nascent but lucrative industry. Introduced in 1996, HIPAA affected system functionality as EHR vendors conformed to the mandated regulations required of covered entity buyers and existing customers. In terms of safeguarding patient health information, the law reshaped the patient-physician encounter and subsequent care-related activities. As a result, EHR system security was upgraded to include the standardization of administrative, physical, and technical safeguards such as roles-based access control, automatic data backups, audit trails, automatic log-offs, and data encryption. At the turn of the century, EHRs began to adopt today’s familiar characteristics, many of which were only outlined during the ‘90s. For example, the systems began to conform to standards developed by leading organizations such as Health Level 7 International. Similar to the business process reengineering activities of the mid-’90s, an emphasis on workflow attributes emerged. EHR marketing literature dubbed improved workflow as the panacea for all of health care’s problems as vendors automated every step in clinicians’ business operations and decision processes. Systems promoted physician interaction with EHRs by not only allowing clinicians to view information entered by others, including reported results, but also allowing them to enter the information by deploying computerized physician order entry capabilities. In general, EHR systems had been designed to collect information from disparate clinical sources, such as lab, radiology, and transcription. However, during the 2000s, many best-of-breed systems were replaced by integrated systems in which all the patient’s clinical, financial, and administrative data could be accessed through a single sign-on without having to toggle back and forth from different source systems. Also during this timeframe, several enterprising EHR vendors sought to provide products for both the acute and ambulatory care settings. Consequently, interoperability became a buzzword as health care professionals realized the benefits of seamlessly exchanging patient data internally and externally, within and across care settings, from one EHR system to another. In another noteworthy development, the acronym CPR gave way to EHR or EMR. In general, EHR was used to describe systems installed in acute care settings and EMR was the choice for those installed in ambulatory care organizations. To this day, experts still debate how to distinguish EHR from EMR. As microprocessors and astonishing networking capabilities infiltrated all kinds of devices, including computers and mobile phones, EHR technology began to mirror that trend. As a result, EHRs have become the centerpiece of health care’s transformation, catering to mobile clinicians who have little use for tethered technology. In addition, because medical consumer devices are emerging as powerful tools, EHRs are incorporating their data for better and more efficient care. Interestingly, most studies conducted over the past 25 years have failed to prove that EHRs save money. (For that matter, it’s never been proven that analog records save money.) Nevertheless, it’s time to move on because EHRs are here to stay. Therefore, it’s vital that health care organizations take advantage of the technology’s power. EHR optimization must include effective classification of the plethora of unstructured patient record data, refined adjustments to all clinical conditions, and the capability to improve clinical documentation. However, the next era of EHRs will not focus as much on features or functions. Rather, the main drivers will be the changing face of health care delivery models, such as accountable care organizations and patient-centered medical homes, and reimbursement systems, including value-based purchasing, pay for performance, and bundled payments. Despite the changing landscape, the technology’s long-term success still will most likely hinge on the enormous task of changing end-user behavior. — Deborah Kohn, MPH, RHIA, FACHE, CPHIMS, FHIMSS, CIP, CHTS-CP, is a member of the For The Record editorial advisory board and principal of Dak Systems Consulting.